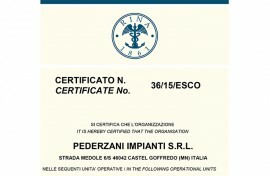 Pederzani Impianti boasts over 40 years experience in the technological, mechanical, electrical, renewable energy, water and air treatment fields in the public, civil and industrial sectors. design, build and install technological, mechanical and electrical plants for the civil, tertiary and industrial sectors. The integration of the electrical component on all our systems guarantees intervention on any plant requirements. We design and build water treatment systems with innovative processes and technologies in compliance with environmental standards. Experience and technological innovation enable us to produce and install any type of system for air treatment and conditioning. We create high energy efficiency systems ranging from various alternative energy sources, based on individual needs. Thanks to the synergy and professionalism available, we can guarantee the necessary support for an ordinary and extraordinary maintenance service on all systems. INNOVATIVE, TURN-KEY SOLUTIONS THAT ARE ENVIRONMENTAL PROJECTS WITH INTEGRATED ADVANCED TECHNOLOGY. We guarantee the necessary support from the design phase to start-up. We build integrated systems at national and foreign level with advanced manufacturing efficiency. SAfter-sales and scheduled and extraordinary maintenance service on all our systems. in the Province of Mantova, Medole road 6S.